« CSAW CTF Quals 2014 - eggshells (100pts) writeup..
Live HTTP Headers is a great little add-on for Firefox allowing user to replay or modify HTTP requests. Unfortunately it seems the replay button has stopped working with recent Firefox versions and I decided to make a temporary fix until the official version is updated. After looking for what could be the cause of the replay button not working I found out that headers containing If-Modified-Since would be replayed properly. If-Modified-Since is a way to tell spiders (those little things search engines use to index your website pages) that this page has been changed since a specific date: "The If-Modified-Since request-header field is used with a method to make it conditional: if the requested variant has not been modified since the time specified in this field, an entity will not be returned from the server; instead, a 304 (not modified) response will be returned without any message-body". For more details about it you can visit the W3 RFC 2616 Page. And copy this file while renaming it with a .zip extension. 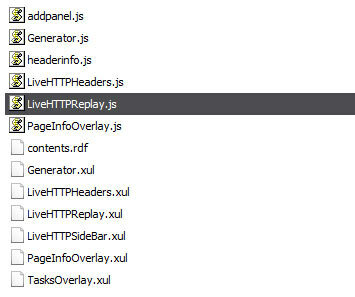 Restart Firefox, try the replay button of Live HTTP Headers. It is now working again.